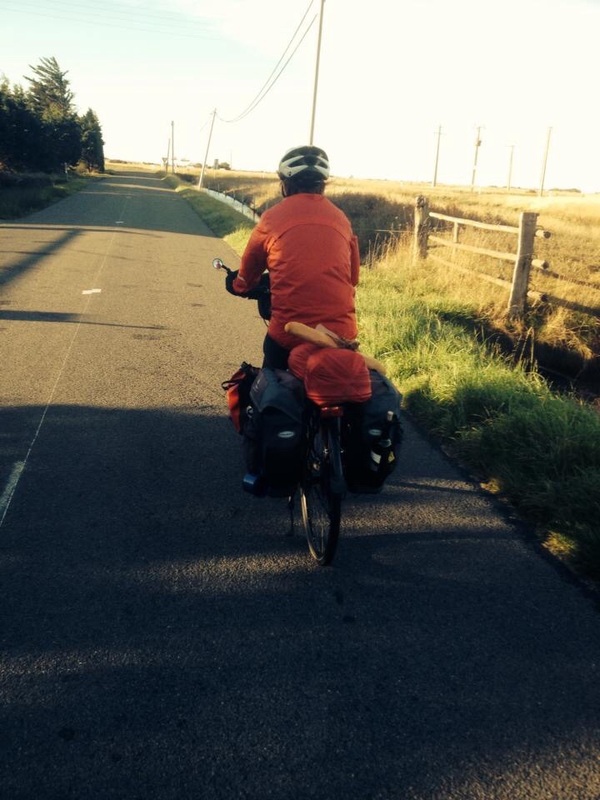 I’m in the autumn of my life, cycling the last of the Canal de Nantes a Brest. Sticky ripe acorns pop off under the weight of our tyres, hidden beneath a multi coloured carpet of crackling autumn leaves. Pock marked pears and bruised apples are left wanting by those foraging for truffles under the oaks. Poking about with their sticks and yapping dogs. Otters eat the horse chestnuts. 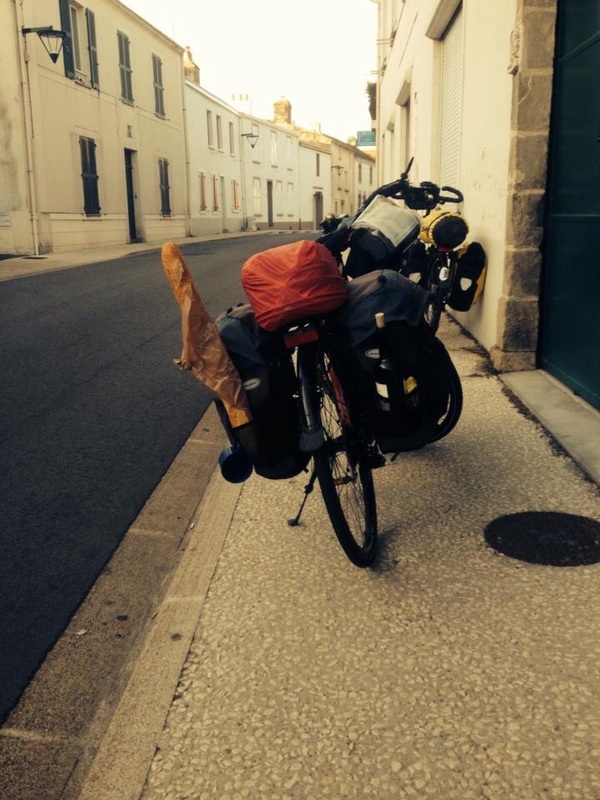 In Nantes we set up camp near the city centre at La Petti Port. It’s fine weather and time to take a couple of days off the bike sightseeing. In the morning the Germans bring us fresh croissants: Thomas and Elsbeth are from Freiburg on a three week cycling holiday. We had met them a few days earlier cycling further up on the canal. I also met a couple of compatriots, Aussie cycling tourists. As is the custom, we exchange tips and stories. Shivering under a clear night sky, my 2am nature break is interrupted by the blood red lunar eclipse , a rare celestial event of sublime beauty , Just as well I had that second cup of tea! Nantes, is the capital of Brittany, housing a medieval castle complete with moat and drawbridge, while the Cathedral is also spectacular. Most tourists come to see the Giant Elephant. 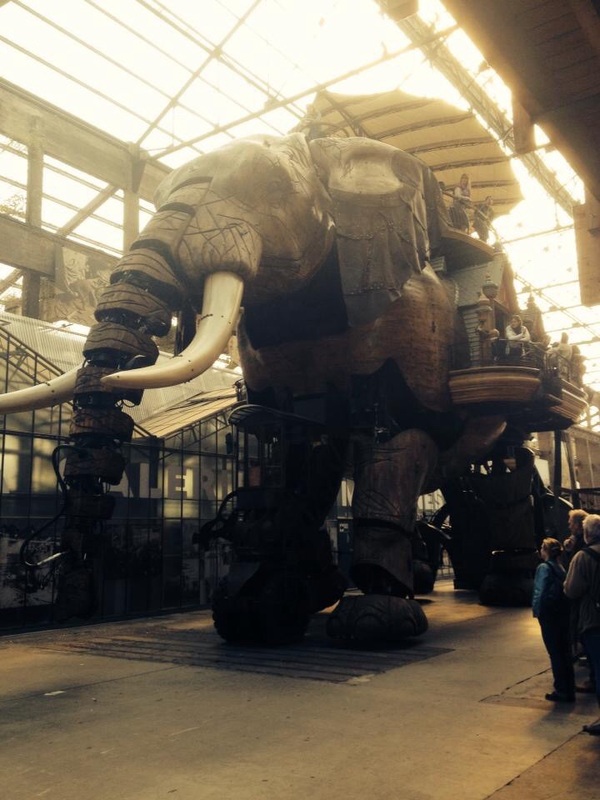 La Grand Elephant is a gargantuan belching mechanical steam punk masterpiece and just like a real circus elephant of old, is the star attraction at the Nantes Museum de Machines. Mind you, the kids carousel of galloping crustaceans and frightening flying fishes runs a close second. Nantes most famous citizen is Jules Verne, author of such classics as 20,000 Leagues Under the Sea and Journey to the Centre of the Earth. Walking through the multi lingual, chaotic, hot and spicy Saturday market, I see fish still flapping on beds of ice as crowds of onlookers attracted by the call of the touts are drawn ever closer to a sale. Fertile ground for a young Jules Verne I imagine. Bourgneuf – en – Retz is some 80 kilometres cycling from Nantes. The route takes us away from the canal and coast inland via little used country roads through small unassuming villages. Often we find a shady stop for lunch. We are always prepared. 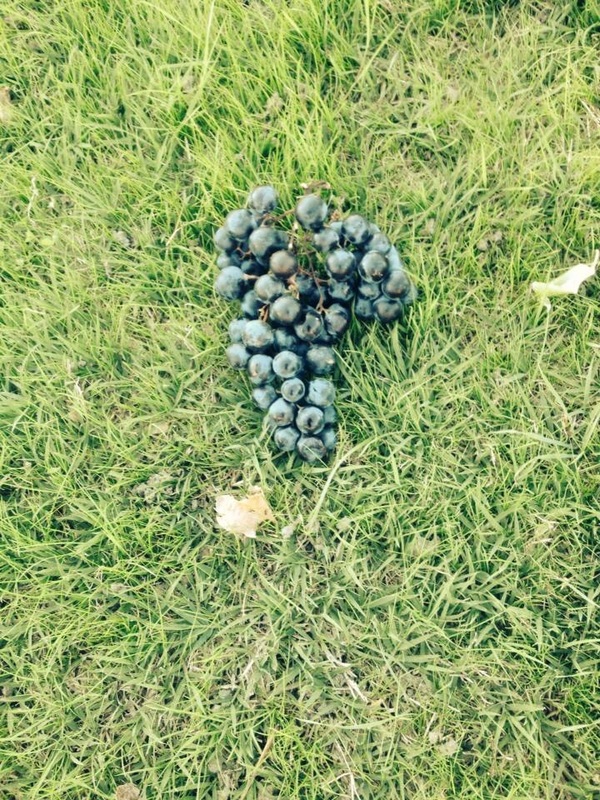 Therese rides with a fresh baguette, some soft cheese and bottle of Bordeaux in her pannier and dessert is supplied by roadside grapevines that are plump with sweet juicy fruit, so much so that the occasional bunch isn’t missed. Cycling towards the Atlantic Coast the rich irrigated countryside begins to flatten out. Thickets of unkept wild figs and blackberries offer little shelter from the increasing wind. 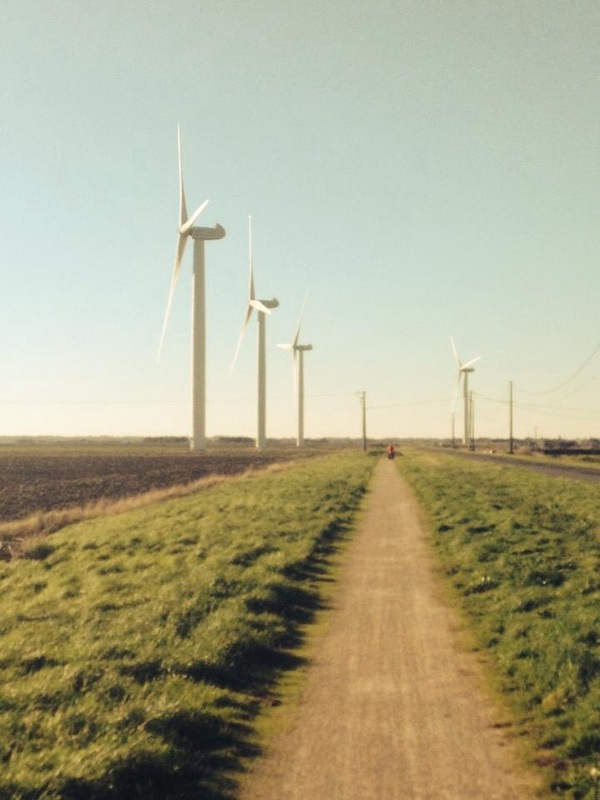 As if on cue, wind farms appear like giant pin wheels, their whooshing pitch keeps time with the slow beat of my heart. 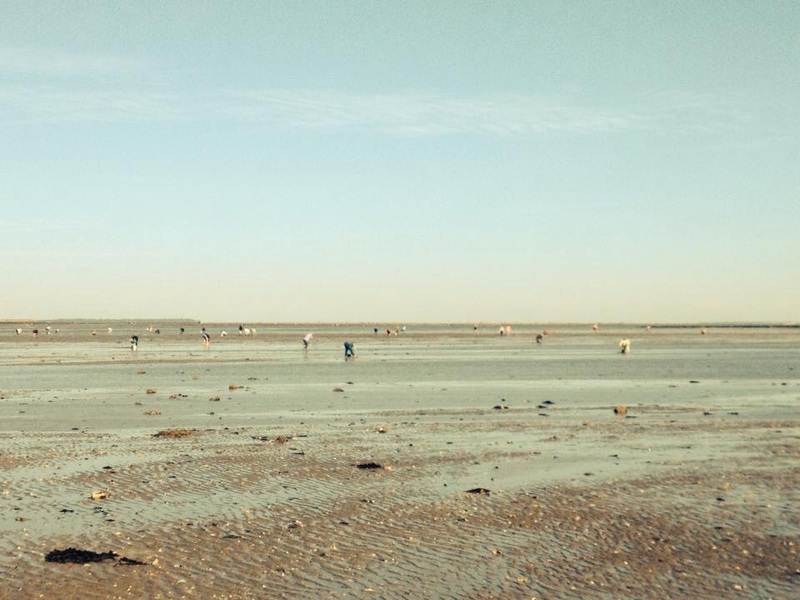 At Le Passage du Gois, we come across an incredible spectacle. 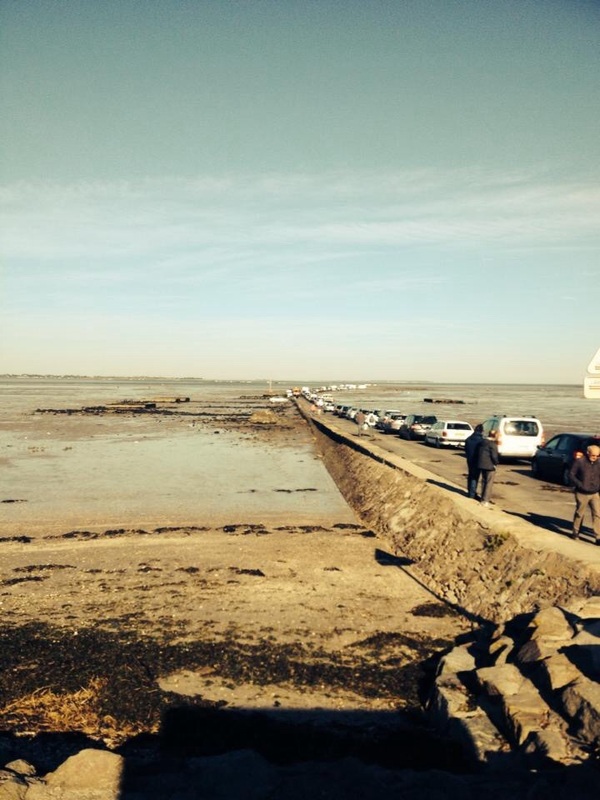 The road to the island of I’lle de Noirmoutier is open for a hour either side of low tide each day. At this time literally thousands of people cause a traffic jam along the causeway as they scurry crab-like out onto the mudflats with buckets, spades, baskets and forks to dig for oysters. The oystercatchers resemble the children they once may have been. Down at the seaside with a bucket and spade. However, they are less carefree and far more earnest in their pursuit, although most seem to be rewarded with a healthy plateful for dinner. 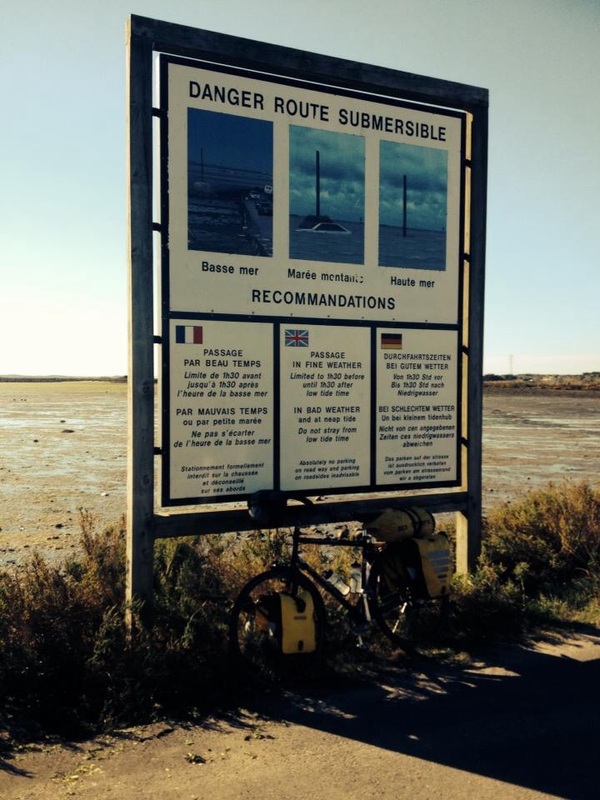 We decide to cycle out past the oystercatchers to camp the night on the island, knowing that we will be marooned and unable to leave until 1pm tomorrow when the tides just right. Tomorrows ride holds the possibility of a visit to a 1/10 scale mini village, so I’m just a little excited! So you must be close to the birth of your second child ? That’s exciting ! How long are you in Europe for ?